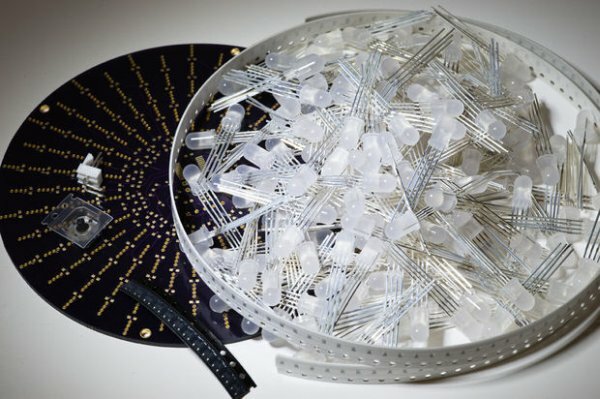 Responding to many requests, Aurora 9×18 Kit is now available, so this is the Instructable specific to building the kit. Please leave comments, especially tips for successful assembly. First, identify all the parts contained in the kit. Below is the parts list. Resistors have their values written on them. Two top digits followed by the number of 0’s after. So 150 ohm would have 151 written on them. Those are so small, be careful not to misplace them. I always tidy up the work area before starting assembly. Make sure you have a good lighting, too. Capacitors do not have anything written on them, so be sure to keep them in the carrier (tape) until you are ready to solder them. Transistors have letters printed on them, however they are codes, so the codes are noted on the list above. Other parts are quite obvious, I think. READ VISIBLE THINGS INDUSTRIAL STARTER KIT IN STOCK NOW! Good lighting is also very important. You can work much better when you can see the details. I’ve shown the “poor man’s reflow” method using solder paste and electric griddle on the Aurora 9×18 Instructable. You can do the same, however hand soldering is still a viable option. I think hand soldering might be quicker for more experienced solderers. * I don’t recommend Aurora 9×18 to be your first SMD project. If you have not done any SMD soldering before, please practice before taking on Aurora 9×18. Aurora 9 bar might be a good project to get your feet wet. There are so many videos showing the SMD soldering techniques on YouTube. You might want to search “SMD soldering” and watch some. You will realize that SMD soldering is nothing to be afraid of. Print out the part placement guide (ideally in color) and follow the order to minimize the errors. 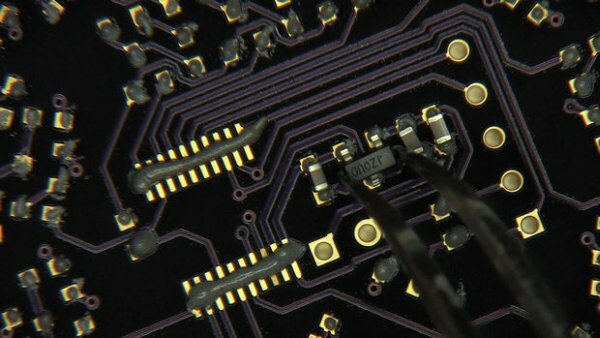 Once all the SMT parts are soldered, inspect carefully for bad joints and shorts. Connect 5V power supply – you can not supply the power from the programmer, as that will stress the voltage regulator on board. See the chart for the pin assignments. 6th pin of the ICSP connector (LVP) is not used. Use only pin 1 – 5. You need to use “High-Voltage Programming” mode, in order to write all of configuration bits required for Aurora 9×18. You will find this option in IDE, under “Programmer” menu -> “Settings”. On “Program Memory” tab, check “Use high voltage on MCLR”. If you are using older programmers which output higher than 9V to program (like ICD 2), please add a voltage limit circuit to protect the PIC24F used. See the photo with my comment. PICKit 2 and 3 are fine without any modifications.